San Salvador (Agenzia Fides) - As part of the preparation for the canonization of Blessed Oscar Arnulfo Romero, which will take place on October 14th in St Peter's Square, the Salvadoran Church has organized the second Pilgrimage entitled "Walking with Saint Romero to build peace", which will cover 157 kilometers and will take place on August 2, 3 and 4. The activities that each parish has organized in view of the canonization will start with this great event. Three important signs will accompany the pilgrims: a cross, the image of Blessed Mgr. 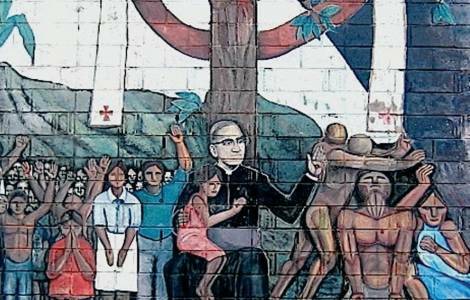 Óscar Arnulfo Romero and the image of Our Lady Queen of Peace. According to the note sent to Fides, the pilgrimage will take place in three stages: the departure will take place in the Metropolitan Cathedral of San Salvador, with the Mass presided over by the Archbishop, His Exc. Mgr. Luis Escobar Alas. At the end of the day, another Mass will be presided by Card. Gregorio Rosa Chávez in San Rafael Cedros. The second stage will be from San Rafael Cedros to Chapeltique, during this phase the dioceses of San Vicente and Zacatecoluca will participate actively. The third stage starts from Chapeltique and ends with a Thanksgiving Mass in the parish of Blessed Óscar Arnulfo Romero, in Ciudad Barrios, on 4 August. As part of the preparation activities, the Pastoral Care of Children together with other organizations have organized a march entitled "Trace of tenderness: we need everyone, zero violence and one hundred percent of tenderness", which will be attended by children from 4 to 12 years age. The little ones will accompany the pilgrimage in honor of Blessed Oscar Romero on 2 August, during a short journey, from the church of San Francisco de Asís to the end of Alameda Juan Pablo II. A second march of the children will be on 11 August, and will begin at 8.30 am from the Basilica of the Heart of Jesus to the Metropolitan Cathedral, where Mass will be celebrated at noon by Cardinal Gregorio Rosa Chávez.